A sweet fitted sundress that's innocent-looking at the front but has a sun seeker's strappy back view, the Mackenzie Dress is just perfect for spring and summer. The fitted bodice has a V-shaped dropped waist at the front, and a natural waistline at the back. The waistline is emphasized with optional piping to show off the shape. The Mackenzie Dress has a choice of an A-line skirt (View A) or a gathered skirt (View B). The dress fastens at the back bodice with either hook and loop tape or snaps. The fully lined bodice is quick and simple to make and the wide straps are easy to turn right sides out, which makes this an ideal pattern for confident beginners and learners alike, particularly when choosing View A with the simple A-line skirt. This versatile pattern comes with a list of suggestions for taking the Mackenzie Dress pattern further; including a bonus step by step photo tutorial showing how to use the bodice pattern pieces to make a cute reversible top. Once you have made one of these sweet sundresses you will want to make many more. The Mackenzie Dress pattern will fast become one of your doll’s favorite dresses. 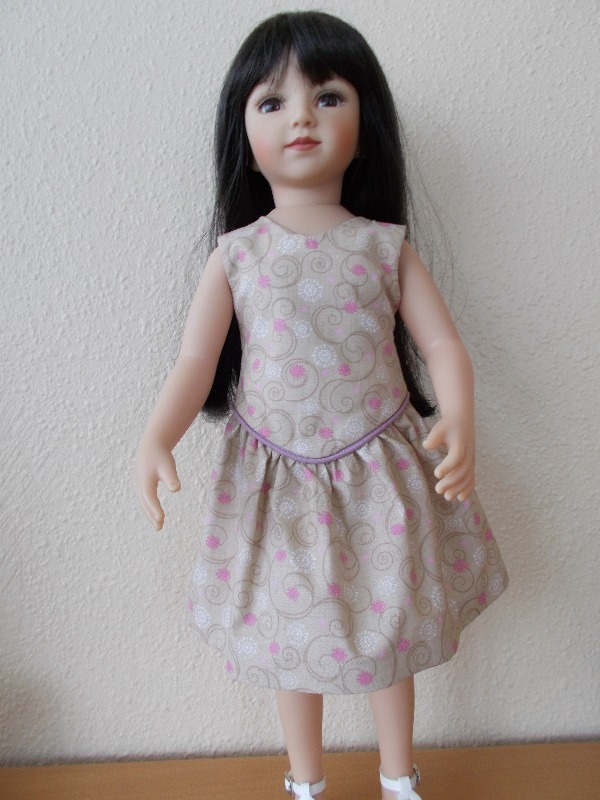 Please see our other listing to make this dress for American Girl dolls. Recommended Fabrics: This pattern is designed for woven fabrics such as cotton lawn, poplin, quilter's cottons, broadcloth, or cotton blends e.g. cotton/linen or polyester/cotton blends. The testers also made this dress in viscose, foil knit fabric and organza fabrics with great results. -One fat quarter (18" x 22") for View A. (Extra fabric may be required to match plaids or large print motifs). -9” of 42”-44” wide fabric for View B. (Extra fabric may be required to match plaids or large print motifs). -For both views you will need 9” x 14” of lining fabric, e.g. lightweight cotton or cotton blends. (Polycotton is ideal). -Half a yard of heirloom mini piping, or you could use home made piping, rick rack trim or ribbon if preferred (optional). If you wish to pipe the entire bodice you will need 1.25 yards of piping. -4” of narrow Ultra Thin hook and loop tape (hook and loop sides) or 2” Anti Snag hook and loop tape, or three snaps for the back closure. I made this dress in all three sizes -- AG, AGAT and KNC. Obviously, I love the style. The instructions were clear. Details included adding piping (which I loved! ), and making a great precision point on the lower bodice. As always, Genniewren has an eye for fit. Je déplore le manque d'information sur les coutures à ajouter ou pas. The directions and pictures are wonderful. I was able to test the pattern and the dress turned out beautifully. There are several sizes to chose from. You won't be disappointed with the results. The Mackenzie dress, no matter what size you are making (yep, there are other sizes! ), is a beautiful and easy to make dress. I think the hardest part, which really isn't all that hard, is turning the bodice right-side out after you're done attaching the lining to the bodice. This dress is beautiful and would make a great holiday dress, sundress, playdress, etc... There are even instructions on how to add piping to the bodice and on how to turn the bodice into a top! I highly recommend this pattern. This dress is a joy to sew up. No need to be afraid of joining the v shaped bodice to the skirt. It all fits like a dream whether you use the a-line skirt or gathered skirt. I love the straps in the back which make this a more casual dress than the front looks.